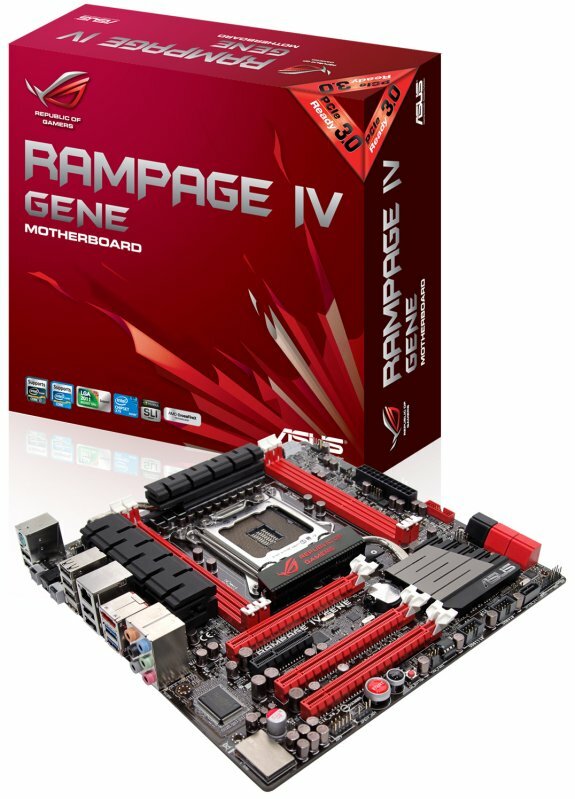 Rampage IV GENE continues the legacy of Republic of Gamers motherboards by delivering gamers with enhanced performance that places a premium on fidelity and speed. SupremeFX III™ EMI-shielded audio guarantees better in-game sound, Intel® Ethernet LAN and ROG GameFirst technology boost online multiplayer performance, while ROG Extreme Engine Digi+ II digital voltage regulation promotes improved overclocking. The board further uses Black Metallic capacitors and NexFET™ Power Block MOSFETs for added durability and heat resistance. Unlike budget micro ATX boards, it supports 2-way NVIDIA® SLI™ and AMD CrossFireX™. Electromagnetic interference (EMI) remains a detriment to quality sound, causing distortion and loss unless properly mitigated. Rampage IV GENE uses a custom PCB “red line” layout which physically isolates SupremeFX III™ hardware from the rest of the motherboard to eliminate interference and generate clearer, more precise, and deeper audio. Better sound helps competitive gamers with improved positioning and spatial awareness, in addition to promoting greater immersion. SupremeFX III™ comes with its own steel shield, a 1500uF capacitor for stable audio power delivery, plus gold-plated audio jacks. The setup has been tested to 110dB SNR, ensuring lossless performance. EAX® Advanced HD 5.0, Creative® Alchemy, and THX® TruStudio™ PRO are all fully supported. Rampage IV GENE comes bundled with a Creative Sound Blaster X-Fi MB2 suite, providing the finest game audio of any micro ATX board, with realistic sound effect reproduction, lifelike music, and theater-grade movie sound. Intel® Ethernet reduces CPU utilization by as much as 35% when processing online activity compared to systems using standard LAN, which combats latency and boosts packet transmission. Better network performance presents an edge for gamers, with the overwhelming importance of global online multiplayer gaming requiring faster connections for a smooth and competitive experience. ROG-exclusive GameFirst contributes to achieving this goal, working as a connection supervisor to prioritize bandwidth availability and ensure games receive sufficient resources, even when downloading occurs in the background. To further accommodate gamers, Rampage IV GENE supports PCI Express 3.0 and 2-way SLI™/CrossFireX™ for increased future proofing and flexibility. Rampage IV GENE ships with the exclusive ROG Extreme Engine Digi+ II design, consisting of digital voltage regulators for refined tuning and higher power efficiency. Gamers can adjust voltages in more precise increments, which aids in overclocking. Supporting this, Black Metallic capacitors and NexFET™ Power Block MOSFETs easily surpass the capabilities of generic parts. They resist heat better, last up to five times longer, and can take up to 20% higher temperatures than generic components, culminating in a highly durable and long lasting board that reduces the likelihood of instability even when running high intensity applications. In addition to its many advantages, the Rampage IV GENE has also secured the honor of being the first Intel® X79-based motherboard formally authorized and certified USB 3.0-ready by the USB Implementers Forum. Certification speaks of the extensive testing and compatibility assurance ASUS puts into every board from early development to shipping. Always committed to advancing technology and giving consumers the best performance possible, ASUS has gone further and self-developed USB 3.0 Boost to accelerate data speeds beyond reference requirements. The multi-mode design of USB 3.0 Boost increases device connectivity for both the traditional BOT protocol and the newer UASP, and its inclusion on ROG boards offers gamers even better value than before. The release of Rampage IV GENE follows the previous launch of Rampage IV Extreme and Rampage IV Formula Intel® Socket LGA 2011/X79 Express Chipset-based models. The three maintain ROG leadership in the gaming and overclocking motherboard segments, providing consumers with superior performance and the finest quality in a vibrant PC gaming scene where technical excellence is critical.